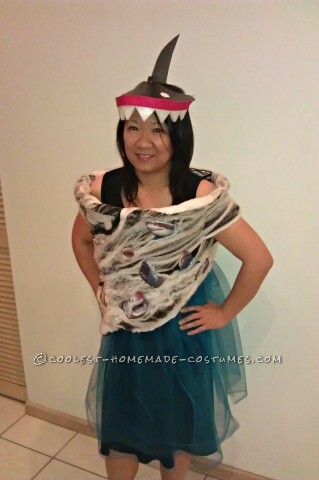 This costume was inspired by the Syfi movie Sharknado. Since this is to be worn to the office on Halloween, I decided to make a waist length version with blue tulle to represent the ocean so I can sit and work. You can easily extend the material to make a full length sharknado. Total spent for this costume is just under $10.00. For the body, I picked up a laundry basket, spider webbing and double sided tape from the Dollar Store. I cut out the bottom of the basket and also 2 holes from the side for my arms to go through. I then wrapped the webbing around the basket to look like the vortex of a tornado and secured it with clear threads. I attached the tulle around the base of the basket to flow like water. Lastly, I cut out printed pictures of sharks and use the double sided tape to attach them around the vortex. Done. As for the hat*, it’s totally made of scraps found around the house. A piece of plastic from the front of a notebook, white foam that came as packaging and some red fabric from a bag handle. First, cut half the black plastic into the shape of a visor and the other the shark fin and base. Then cut triangles into the foam to look like shark teeth. Everything is held together by using a glue gun. Done. *Alternately, you can buy two already made visors and white felt from JoAnn or Michael’s. Cut one of the visor in half (it’s the exact some shape as a fin) and cut teeth shape into the felt. Attached these items together and use a red marker to color the top of the felt to look like gum. This was super easy to make and the best part? No one has one just like it!